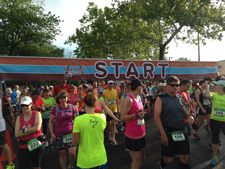 This USTATF Certified Half Marathon route includes something for everyone: flat and scenic views of the Missouri River, quaint and historic downtown Washington, wide open spaces in rural surroundings and VERY CHALLENGING HILLS! The 5K route takes runners along the riverfront area of town and on near our gorgeous city lake. Funds raised by RTR support Foundations for Franklin County, a volunteer-led non-profit agency dedicated to creating a safe and healthy community by supporting programs that strengthen families, including those impacted by addiction. Entry fee includes finishers’ medals for EVERYONE, cotton T-shirts for 5K runners and EveryRUN participants, and moisture wicking shirts for Half Marathoners. All participants will receive official RTR swag including decals and sponsor goodies. Team runners also qualify for extra prizes! Awards | Awards are based on overall chip time, as this event is start and finish chip timed. Commemorative plaques for the fastest male and female in the 13.1M and 5K. 1st, 2nd, and 3rd place medals in each age group for both the 13.1M and 5K. 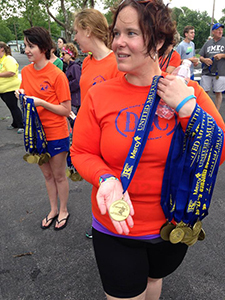 Also, race-specific finishers’ medals provided to all participants! Age groups are: 12 & under (5K only), 12-19, 20-29, 30-39, 40-49, 50-59, 60-69, 70 & up. Register online or by printing and mailing in the downloadable form. For the safety of our runners, no pets will be allowed on the race course. Strollers are permitted on the 5K course only. 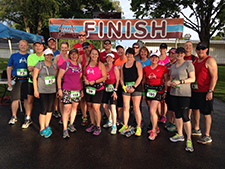 Time Limit for Half Marathon Participants | Walkers are very welcome to participate in the RiverTownRun Half Marathon! However, we will need to close the race course according to a rolling 17 minute per mile pace, beginning at 8:30 am. If you would like to walk at a rate that is more relaxed, please just move off the streets and onto the sidewalk or shoulder, as we will need to reopen the roads to traffic. Race Course Volunteers will be available to direct you. Official electronic finish line timing will conclude at 12:30 pm, which allows 5 hours for participants to complete the Half Marathon and their time to be listed with Fleet Feet’s official Race Results Page. Participants who arrive after 12:30 will still receive an official Finisher’s Medal, provided they complete the race course by 2:00pm when the Runner’s Village /Finish Area will officially close for the day.